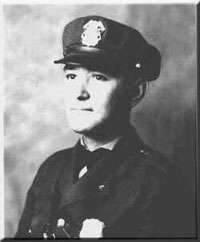 Hired April 11, 1928, Ed VanWagenen was the first full time officer hired to form the Utah Highway Patrol. He had been a Provo City Police Officer for three years. He was issued a 1927 Harley Davidson motorcycle and later a 1928 Model "A" Ford. On May 23, 1931, while conducting a stolen vehicle investigation, Patrolman VanWagenen, fell onto a large circular saw used to cut firewood. The saw severed VanWagenen’s right side penetrating his liver and lung. He died later that same day at the age of 42. His wife, Johanna, obtained employment at the Utah State Mental Hospital at Provo, Utah to provide for herself and her five boys. In 1935, Johanna was brutally attacked by a mental patient with a pair of scissors. Johanna died a few days later.